The TAP® Tucker Assessment Profile is an assessment instrument and developmental coaching process used by companies worldwide to select and/or develop their expatriate personnel. It measures an individuals motivations, expectations and twelve other competencies required for successful intercultural adjustment. It is used as an integral part of our expatriate coaching process. 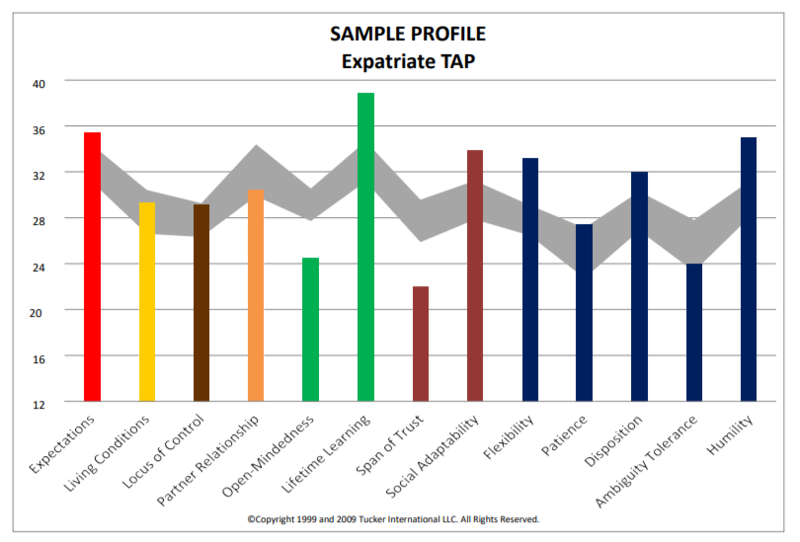 The TAP is based on our fourteen competency model featuring reliable and valid scales that predict intercultural adjustment over time, which is highly correlated with expatriate performance. Typically our process consists of the completion of the TAP® Tucker Assessment Profile followed by a telephone feedback and coaching session with a Certified Tucker Assessor and Coach. The purpose of this session is to review the employee’s results, verify those results with a behavioral interview and initiate development of the key items measured in the TAP. The individual receives their results on the day of their session in the form of a comprehensive guide along with an Intercultural Competencies Development Plan. The TAP is is professional and personal development tool that identifies areas of strength and areas for development with the overall goal of improving an individual’s effectiveness and experience while living internationally. It is based on over 40 years of empirical field research and over 40,000 assessments performed for hundreds of client organizations. The selection and/or development of employees and spouses for specific international assignments. Integration into intercultural or other group training programs. As part of an international career planning and development process.